When you’re on the trail or in practice, you know when your horse starts to get spooked by something. It doesn’t matter if it’s another person entering the stall or just a loud noise in the distance that scares them, you can often feel it coming on before it happens. Easing your horse’s anxiety and nervousness is not only critical to the health and safety of your horse, but also those around you and yourself, too. Here are some ways to help calm your horse before they hurt themselves, others, or you when they’re spooked. Keep the activity to a minimum if possible – Depending on where and when your horse becomes anxious, try to limit the amount of activity you’re asking them to do during that time. Limiting activity and stimuli can help your horse’s nervous system calm down because it does not have to focus on performing the task at hand. 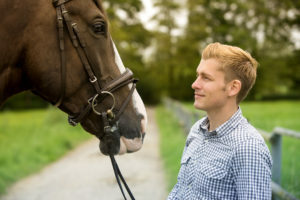 Communicate – Unlike other animals that are wired to be people-pleasers, horses can be stubborn when their expectations are not clearly communicated to them. Making clear of what is needed means that an established pattern or plan in what to do when the horse is scared is necessary, and finding a way to deliver this as efficiently as possible. If you’re looking for horse trainer insurance to help keep you covered when something happens, turn to us at Ark International Group. Give us a call at (320)243-7250 or visit us today at ArkAgency.com.